Today's version of martech_ams3.exe brings support for RNS 510 fitted in Bentley cars. Update is free for every RNS 510 activation owner. Warning: this model goes via different connection. Supported function for that moment is read out original code using Normal Mode. - code reading goes via partial flash and i2c reading which do effect in original code. it works more stable than just read out code with tms470. Simply: you need to connect jtag+i2c like for repair locked. We are glad to present long awaited free update for RCD PRO and Security Repairer users. Connection scheme and video from using link. From now, it's possible to read out original code in older units based on 24c16 (ulvwmp3, rcd210 etc). Miło nam zaprezentować najnowszą dawno oczekiwaną darmową aktualizacje dla użytkowników RCD PRO i Security Repairer. Od tej chwili możliwy jest odczyt również oryginalnego kodu w radiach Technisat opartych na 24c16 (np. ulvwmp, rcd210 etc). From now, you can programm in circuit CCC modules. It's possible to read / write within seconds internal, external and eeprom connected to ST10. No need to desolder anything. Today very big update for RNS 510 activation. Interface: now tool is divided in Normal / Test Mode, you can read all details, change possible data and write it device. You can save unit configuration to file, restore it later. If function is possible to change then you can click and change value in combo menu. New HW/SW: tool recognize new units automatically, after Safe to Enter Servis Mode you can use Test mode and its function without any risk of damage. With this option - all units are supported for now. For sure you will like this update ! It's free for every RNS 510 activation user. As always - update is free for activation owners. 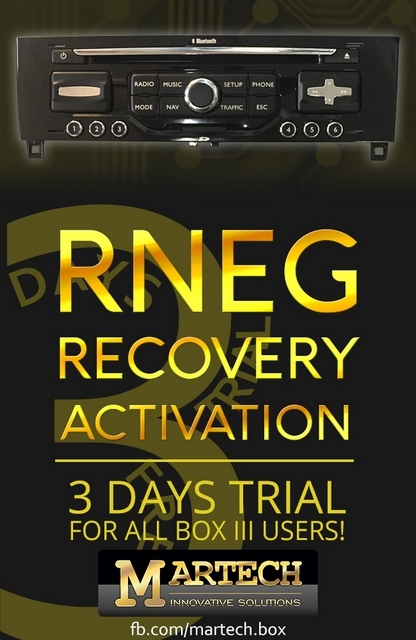 RNEG Recovery Tool released + new reseller for Germany! RNEG Recovery Tool was designed to repair software faults on Citroen and Peugeot navigation units. Easy connection and fast repair process will help you to repair most common software faults. All users of Box III gets free 3 days trial of activation, from the day of release. You can see how it works and get in touch with software. If you are going to buy it, it's already on our [url]shop.martech.pl[/url]. We would like to introduce our new distributor for Gemany. They are represneting from now on Martech in Germany. Their main business is repairing defective car electronics for workshops and they are situated in in the north of Germany near Wolfsburg where the Volkswagen is build. Please don´t hesitate to contact them concering our Martech Box. Aktywacja RNEG Recovery Tool została stworzona do naprawy nawigacji montowanych w autach Citroen oraz Peugeot. Proste podłączenie i szybka procedura umożliwia naprawę większosci usterek programowych. Wszyscy użytkownicy Box III otrzymują 3-dniową aktywację programu, od czasu wprowadzenia programu. Otrzymujesz w pełni funkcjonalny program, jeżeli już jesteś zdecydowany na zakup to zapraszamy do naszego sklepu.